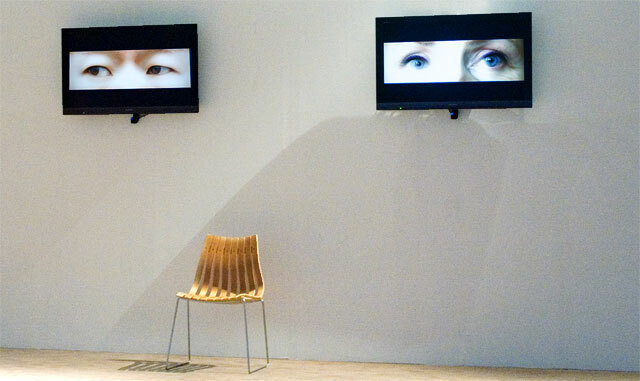 "Gruppen (uden dig)" / "The Group (without you)" is an evasive surveillance installation using biometric face-recognition. A large set of jumpy eyes watches the exhibition space. Big-Brother is rendered as an insecure brother or sister, and not as a mythological "Eye of Providence". When gallery guests stare back at the image, the projected gaze disappears. But as soon as nobody is looking, a new set of eyes starts to monitor the space. This project was made for the Pixel Gallery, Copenhagen. Thanks to curator Morten Søndergaard, Biotopia. The production was supported by the Danish Arts Council Committee for Visual Arts.